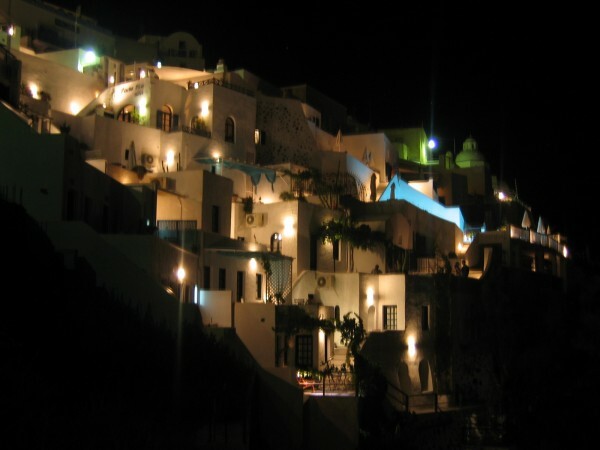 Fira’s houses glow snow-white in front of the black caldera edge, looming 300 m. 566 stairs lead steeply up through a maze of narrow lanes, and even more rambling houses. 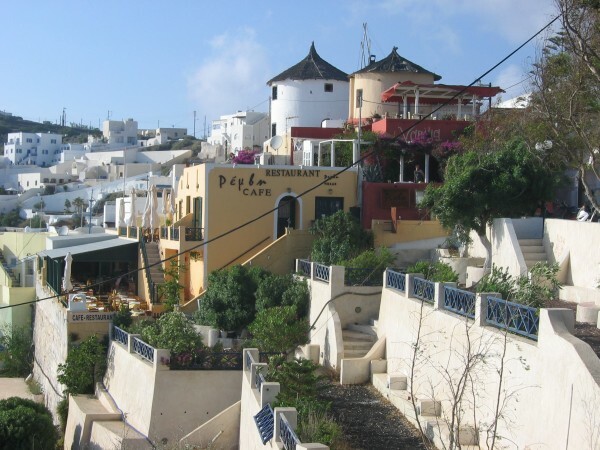 Some of them use their roofs as a terrace. It is much more relaxed to get up by cablecar, or on a mule’s back. 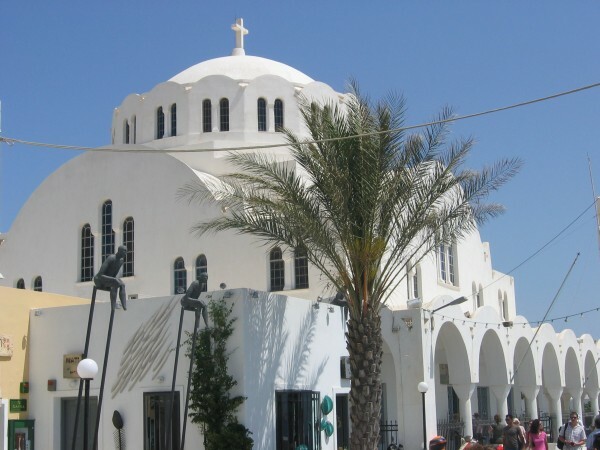 Just beside the orthodox cathedral there is the Atlatnis, Santorini’s oldest hotel. 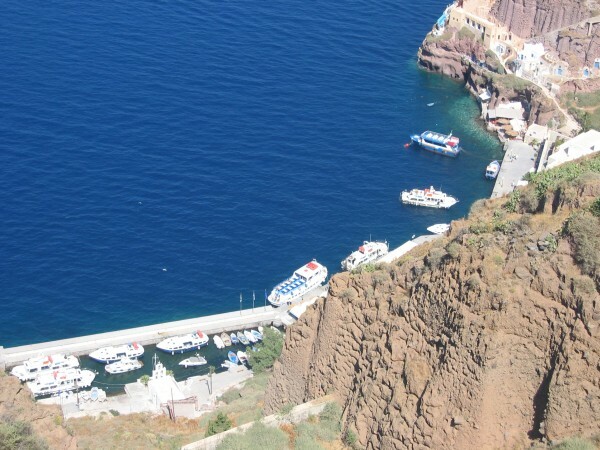 The small port of Skala once was landing stage for most ferries, but today only small boats and cruisers anchor here. 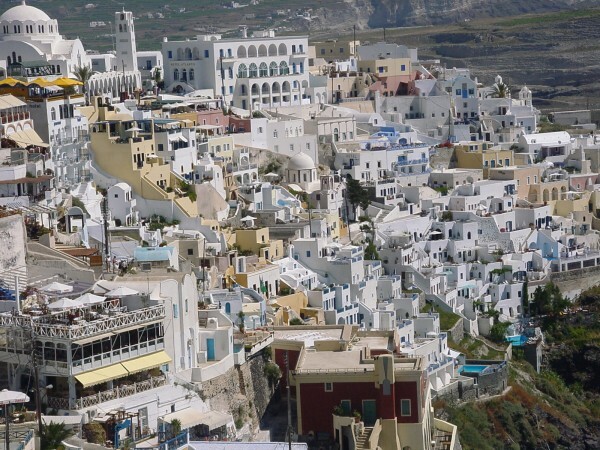 Being Santorini’s centre and capital, the former contemplative town of Fira has lost a lot of its idyll due to restaurants, cafes, snack bars, souvenir shops and travel agencies. 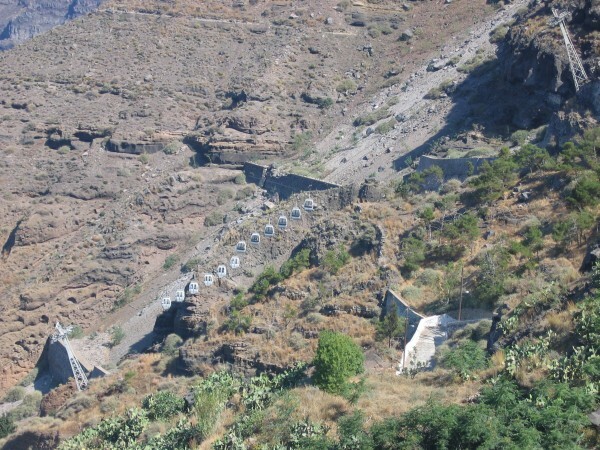 What remains is its unique location and the breath-taking view – the keyword is "caldera view". Every evening one is impressed by the always unique sunset. To watch it is cult – that is why the promenade gets really crowded by that time. 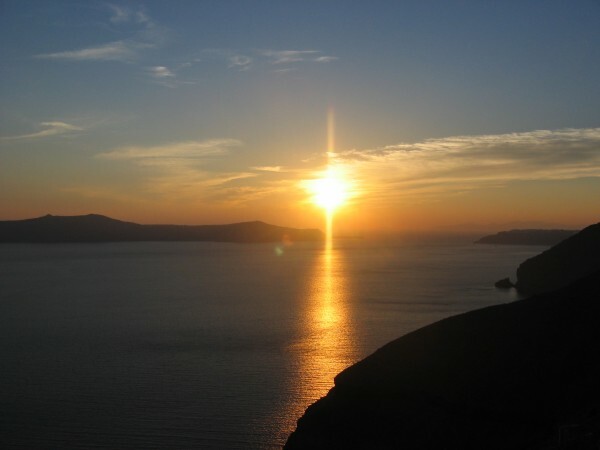 When the evening light bathes the houses and lanes in a golden shine, and the other islands’ dark shapes emerge in front of the red sky, all the tavernas are crowded as well. 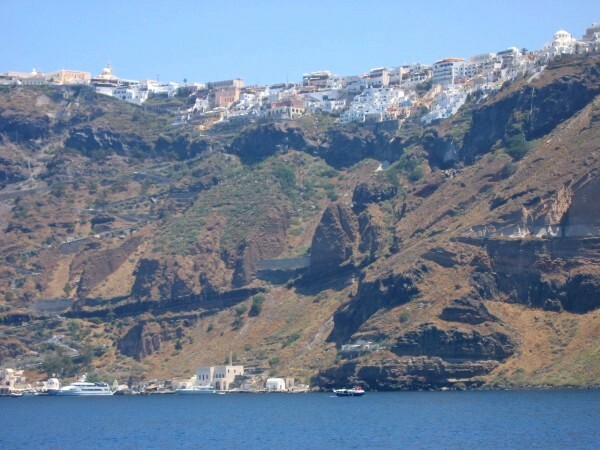 Among Fira’s sites there is first of all the Archaeological Museum, presenting findings from the Geometric, Roman and Byzantine time. Not far from the cableway station, in the former Catholic district, there is the Catholic cathedral with a Dominican cloister. 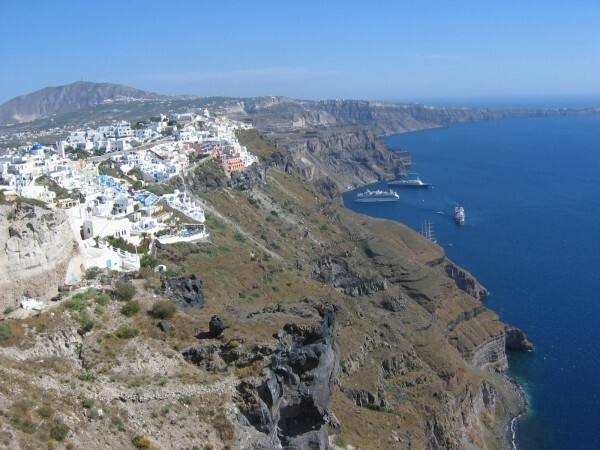 In the Megaro Gizi Museum, you can see photos showing Santorini before and after the horrible earthquake in 1956, as well as a collection of old engravings and documents, taken from the island’s bishop’s archive. Also, familiy Gizi’s Venetian style residency is well worth a visit. 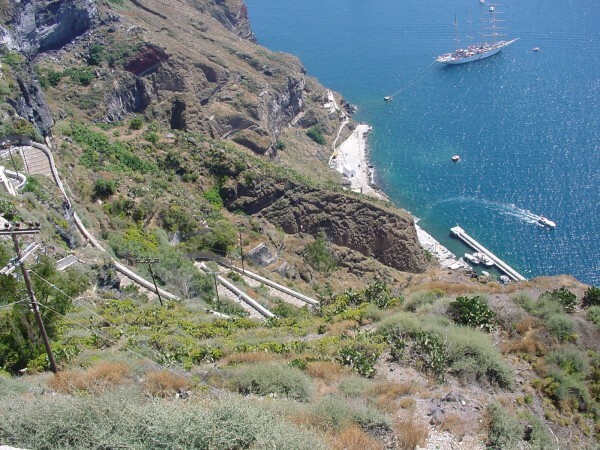 Lines between Fira and its neighbour villages Firostefani and Imerovigli are blurred. 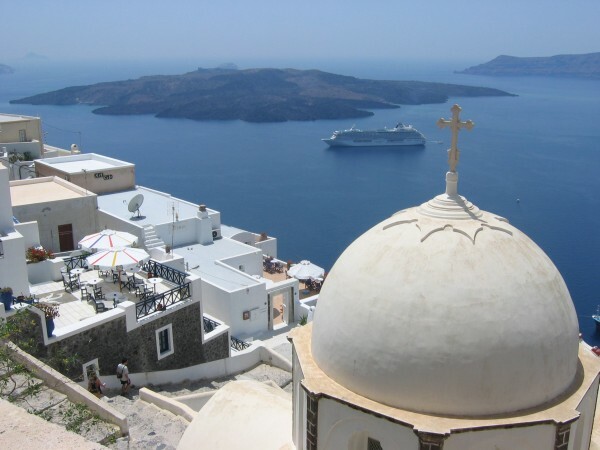 If you prefer calm, your choice should be Firostefani. 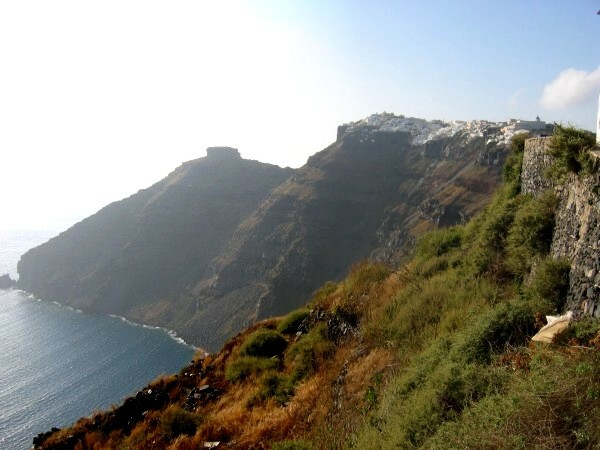 It is a dream in white, which can be reached within fifteen minutes and is departure point for one of the most beautiful walks on Santorini: walking along the caldera you get up, on narrow paths, up to Oia.